Everyone loves a good BBQ and buying the best grill can seem like an overwhelming affair. There’s so much choice that it can be paralyzing trying to decide which kind of grill makes best sense. In today’s best gas grills reviews, we’ll laser in on 5 of the top-rated grills coming in at a range of price points so your buying decision is simple and streamlined. We’ll get straight down to it with further ado before finishing up with some sound advice on how to get the very best gas grill for your money and personal requirements. Now, let’s go into detail about each of these Best Gas Grill Reviews in 2018. Weber is a household name when it comes to gas grills. Back in 2014, they tweaked their entire legendary Q Series. In today’s Weber Q3200 liquid propane grill review, we’ll look at the uprated version of the old Q320. Convenience should always be uppermost with a gas grill and the last thing you need is equipment that takes an eternity to set up. All you need to do is whip out your Weber, unfold it, pop in a couple of screws and you’re ready to blaze up in minutes. Electronic ignition means you can kiss goodbye to nursing charcoal to life with fire starters then waiting for it to heat up. Just hit a button and the 2 stainless steel burners will fire up fueled by the propane tank so you’re able to get straight down to business. You can opt for a natural gas model but we tested the propane version so all information below relates to this model. With the natural gas lines required for the other model, it’s not a mobile or portable choice so we rolled with the more multi-purpose propane. The cooking area is substantial but not suitable for large parties. You’ll get more than enough space with the primary cooking surface of 393 square inches for friends and family so keep your expectations realistic and be aware of the size going in. This is extended by a further 75 square inches thanks to the warming rack so you’ll enjoy a combined area of 462 square inches. As a guideline, you’ll be able to rustle up anything from 15 to 20 burgers at a time which is not such bad capacity. You might ask yourself if the 21,700 BTU (British thermal units) of power is sufficient. The answer is an unqualified “Yes.” Weber designed cast iron grates which do a magnificent job of dispersing and retaining heat meaning you’ve got more than adequate grunt from the pair of burners. You can replace one of the split grates with a griddle if you want to get some breakfast on the go. The griddle does not come with the package so you’ll need to invest in one separately but it’s a nice option to have up your sleeve. It’s also well worth your time ordering up some Weber drip trays. Weighing in at over 80 pounds, this grill is no lightweight. Luckily, it comes along with a nifty wheeled cart so you can move it around hassle-free whether you’re in the garden or out camping. When cooking food for a BBQ, getting the temperature right can be a tiresome affair of trial and error. This is particularly crucial with chicken which can end up giving you food poisoning if it’s not properly prepared. The Q3200 boasts the same accurate thermometer as the rest of the Q Series so you can kiss goodbye to guesswork and embrace food cooked exactly as you want it fuss-free. Upgraded control knobs on the all-new Q3200 allow for seamless and fully flexible fine-tuning of temperature so you can change up or down with infinite gradations offering a wonderfully adaptable cooking experience. Cleaning up after a full-blooded grilling session can be enough to give you nightmares. The porcelain enamel covering the Weber means you can wipe everything down with ease and relax into your afternoon. The version we checked out requires a 20-pound propane tank. These tanks are readily available at reasonable cost. You will need to make provision and buy one separately then think about replacements when necessary. Make sure you factor this into your budgeting. It’s also worth thinking about picking up a Weber grill cover to prolong the lifespan of your gas grill. Considering the robust price, the plastic used for the side shelves is something of a disappointment. Make sure you use them with care to ensure your grill gives you plenty of service without an unfortunate breakage. We really would have expected more from Weber on this count. You won’t be able to use briquettes or lava rock with the Q3200. If you enjoy smoking your food, though, there’s a tube to help you get smoking. 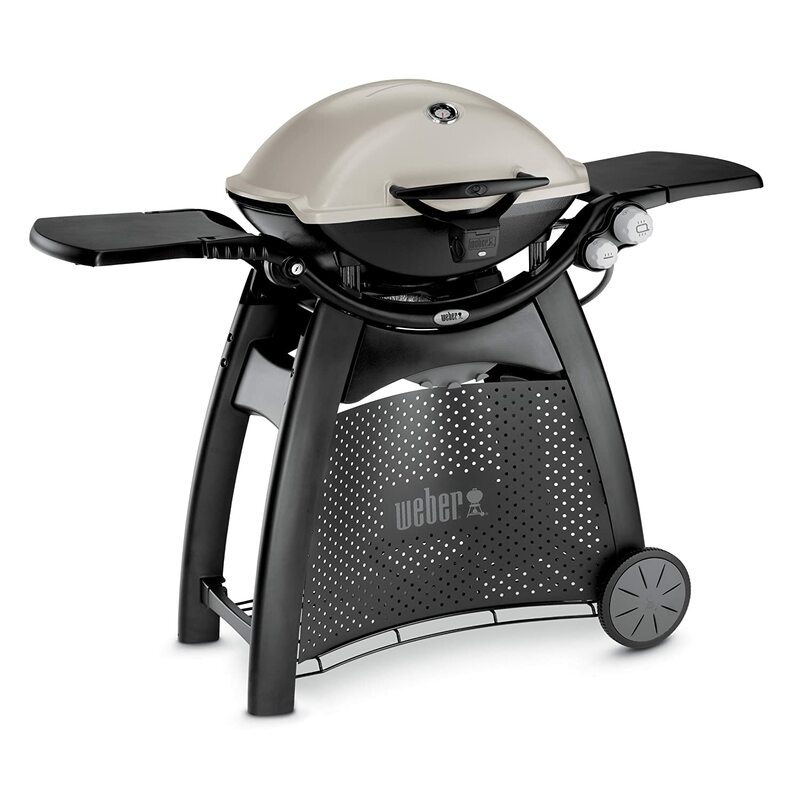 If you check out this outstanding gas grill, you’ll see that Weber’s strapline of “By grillers, for grillers” is no hollow boast. For one of the best gas grills currently available, you could do far worse than the Q3200. Road test the Weber today and get barbecuing with a vengeance tomorrow. While the retail price of the Char-Broil Performance 650 is roughly comparable to the Weber, you can currently get an excellent discount putting this hard-hitting gas grill almost in budget territory. Not everyone wants a tech-driven top-of-the-line grill since everyone has different requirements. If you’re on the trail of a more basic gas grill for occasional use, the Char-Broil fits the bill perfectly and is next up in our look at the top-rate grills today. The Char-Broil is very large and takes up a lot of real estate. Despite the casters it sits on, we’d hardly call this a portable grill. That said, the obvious trade-off is the sheer volume of food you’ll be able to produce using the 650. Think about exactly how and when you’ll use your grill and decide whether you want something this bulky. It measures up at roughly 45 x 62 x 24 inches and tips the scales at a hulking 127 pounds. In terms of cooking area, you’ll be spoiled with the Char-Broil’s exceptional 980 square inches of available surface. With a 650 square inch primary area for which this model is named and a rack offering a further 280 square inches – this folds away to save space – you’ll be able to pile on the burgers and hot dogs even if you have a large party to entertain. If you want to rack up 30 burgers with 10 or 15 left heating in the wings, this is one of the best grills you can find. Surface area is useless without adequate heat and the 5 top-ported burners made from stainless steel combined with the side burner kick out a sterling 60,000 BTUs. Previous models in the Char-Broil range have boasted substantial cooking areas without the power to match. The manufacturer learned from this error and you’ll get more than enough oomph with the 650. It should be noted that the side burner, rated at 10,000 BTU, gives you a little more grunt than you’d expect. As well as simply heating up a sauce, you’ll have the scope to cook up some veg or cook up some rice and pasta without taking an eternity. If you’re a fan of nicely seared steaks, you’ll appreciate the sear burner. This is a nice touch that separates the Char-Broil 650 from many competitors. As with every gas grill, you need to think about whether cleaning will induce a headache. The layer of porcelain enamel ensures that blitzing the 650 is as simple as gently scrubbing it down with a damp cloth. The more frequently you clean your grill, the less work you’ll have to do each time so we recommend keeping on top of maintenance. This porcelain enamel coating also goes a long way toward stopping your food from sticking to the grill for a double-win. While it might look the part and appear pretty heavyweight, the 650 is actually lighter than comparable grills due to the thinner and relatively low-grade stainless used in its construction. So you know exactly what you’re getting into before committing to purchase, a reasonable estimate would be 2 or 3 years of life from this grill due to build quality so buyer beware. As with pretty much all propane gas grills on the market, you’ll need to get yourself a tank separately. These are not expensive but make sure you take it into account when you’re pricing up your purchase. Cater for the cost of ongoing replacements as well. The Char-Broil Performance 650 is not without its snags but it’s a purposeful and substantial grill if you’re looking to cater for larger parties at home or out on the campsite. If you want to invest in a grill that will last for a decade, this might not be your best option. Although it looks built to last and is marketed as highly durable, we would draw your attention to the fact it might well rust out unless treated with kid gloves. Also, the components could be more rugged so think of this as something good for a few seasons, take the price into account and consider the climate where you live before investing. If you live somewhere with little rain and you don’t mind buying a cover, it’s a great budget grill. For anyone regularly cooking for large parties after a pocket-friendly gas grill, the Performance 650 is well worth popping on your shortlist. The Coleman Road Trip, as the name indicates, is marketed primarily as a travel grill. Whether you’re camping or tailgating, heading for a picnic or just on a road trip, you’ll be able to enjoy delicious barbecued food without needing to spend a fortune. Most portable grills are… well, just too small. It’s senseless having a neat grill you can take anywhere if you’re resigned to cooking burgers two at a time then running out of gas after 10 minutes. There’s no such nonsense with the Coleman. 285 square inches of cooking area means you can feed 3 or 4 people with ease. Since the burners kick out 20,000 BTU, you’ll have more than enough power on tap. This is accomplished through a pair of adjustable burners affording you plenty of cooking flexibility. The Coleman also scores in terms of size and weight. It’s a slight 50 pounds and measures around 19 x 13 x 33 inches so it’s a nimble little grill. This is further enhanced by its collapsible nature so you can break it down and pop it in your trunk then get up and running in an instant when you’re ready to eat. An oversized handle and wheels simplify moving it around further. Coleman’s proprietary InstaStart system makes sure you won’t be scrabbling around for matches when you’ve got steaks and hot dogs on your mind. Push the button and you’re good to go for 60 minutes straight. Most grills tend to come in either black or silver with no further options available. The Coleman allows you to choose from 8 vibrant color schemes which is a nice touch, particularly with a cheaper gas grill. There’s a slight price discrepancy according to color so, if you’re on the hunt for a real bargain, go with the red for best value. Cleaning is something of a mixed bag. Coleman have made a series of design improvements over previous iterations of this grill. The cast iron grill plates themselves present no problem. They are coated with a sheen of porcelain enamel and all you need to do is wipe them down or soak them with no need to mess around seasoning them like with some grills. The grease trap goes a long way toward reducing clean up too. The more tiresome element is the need to clean the whole affair after every use. Use some gentle soap and warm water and make sure to dry everything afterward. One handy hint to help keep the mess from building up is to put a foil lining inside lessening your workload for a few cents. Build quality has definitely surged upward with this new model. Coleman have addressed inexcusable issues like handles or lids that melt and you’ll get a solid, dependable grill fit to last. You will need to take care of it, though. The exterior picks up scratches easily while the inside can rust out in a flash if you don’t look after it. That said, the superb 5-year warranty should give you plenty of confidence if you’re unsure about buying this gas grill. Make sure you get yourself a supply of propane gas tanks as these are not supplied with the grill. If you’re looking for other optional extras, you can also opt for a stove or griddle surface to expand your cooking repertoire at a reasonable cost. While portability and maneuverability are uppermost, this doesn’t come at the expense of grilling space or heat output. Considering the ultra-low price tag, it’s incredible that you can get such a powerhouse of a grill capable of churning out a few hours of BBQ food on a single cyclinder. Coleman’s fantastic 5-year limited warranty ices the cake if you’re in any doubt about this gas grill. For anyone who frequently cooks on the go in any capacity, we can’t recommend the Coleman Road Trip LXE strongly enough. 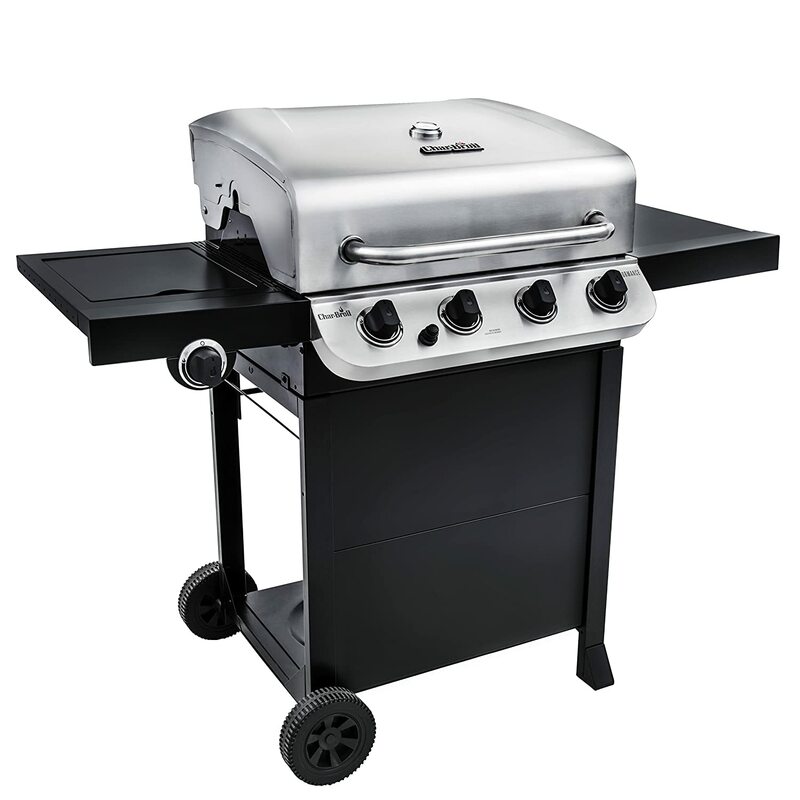 Don’t let the price fool you… This is a top-notch gas grill and well worth the modest investment. We’ll step things up a gear in terms of performance and price range with the magnificent Royal Gourmet Mirage MG6001-R. This is a leading candidate for the very best grill money can buy. Where the Coleman redefines grill portability, you’re certainly not going to be popping the Mirage in the trunk for a quick trip to the beach or campsite. It weighs over 200 pounds and measures approximately 49 x 24 x 75 inches so it’s a full-blooded grill to grace any permanent set-up in the garden. The cooking surface is equally man-sized. The primary grill area is just under 700 square inches and you’ll also benefit from an additional cooking area with side burners so even if you host large garden parties, you can keep the food coming seamlessly in large quantities. It’s not just size where you get what you pay for with the Mirage. Porcelain grates will wick the flavor away inside your meat making certain you get impeccable quality as well as quantity with this grill. You’ll get a good variety with the 6 burners at your disposal. The main tube burners are made from stainless steel while the brass side burner lends further versatility to this capable grill. The added bonus is an infrared back burner so you’ve got all bases covered in a grill that’s dependable, high-performing and able to deliver catering-sized quantities of food without impairing the quality. Once you’ve got your burgers and steaks on the go, you’ll benefit from the stainless steel lids and fireboxes coated with porcelain. Heat is beautifully retained and you’ll realize where the money you spent went. Build quality overall is outstanding and the Royal Gourmet Mirage is a grill built to last for years. Little touches like aluminum caps on the end of the lids to prevent damage or breakage show a welcome attention to detail. You won’t need to keep grabbing a separate thermometer to check your chicken is cooked through and through. The integrated units are accurate and convenient. Thinking of convenience, the tool and utensil hooks stop you from working in a cluttered space and you’ll have everything you need in arm’s reach. Controls are really user-friendly and mounted on the front of the grill for easy access. There’s a storage cabinet front and center, too. The steel doors cover a cavernous space where you can stash away all your BBQ accessories, cutlery and crockery. When it comes time to clean your grill down, you’ll be glad of the porcelain enamel coating meaning there’s no stubborn food debris to deal with. Just wipe it down and do so regularly to prolong the lifespan of your grill and keep things hygienic into the bargain. 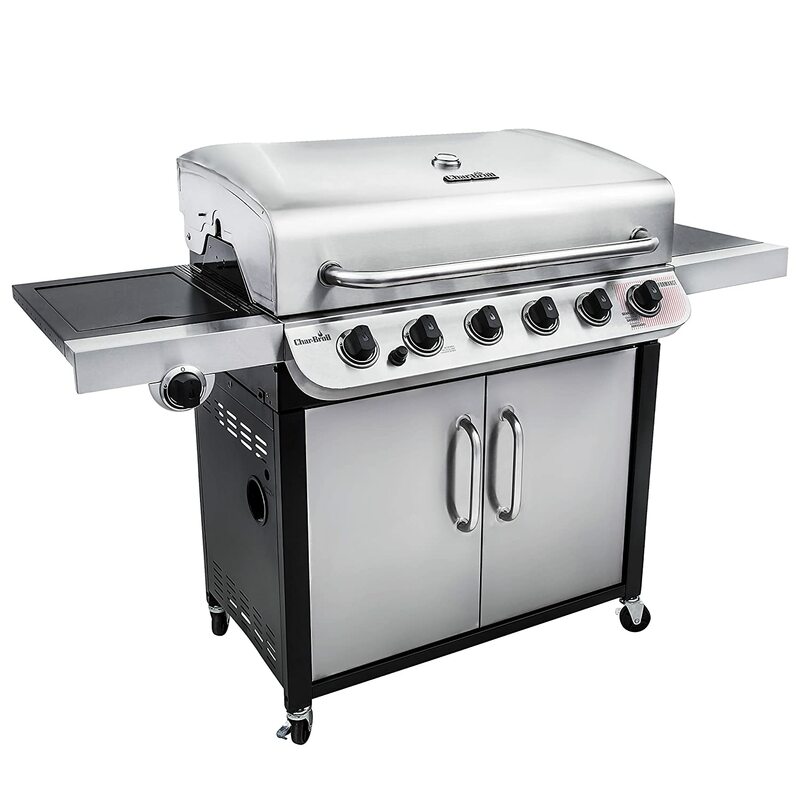 If you have a fluid budget and appreciate true quality, the Royal Gourmet Mirage MG6001-R is, quite simply, among the best gas grills currently on the market. While not everyone wants a monstrous grill capable of churning out party-sized volumes of food, for those who do, the Mirage is just about perfect. Other than the price and lack of a cover, there’s nothing much we can come up with to knock this grill and it excels in every capacity. Check out the Royal Gourmet Mirage and get ready for many seasons of happy garden parties and BBQs in return. As we reach the end of our best grill reviews, we’ve got something occupying the middle ground in terms of size, performance and price. We always try to offer you a broad spread of products to choose from rather than ploughing the same furrow with 5 almost identical pieces of kit. The Char-Broil Performance 475 is another fantastic propane-fueled gas grill from a brand you can trust. Char-Broil has been in business for more than half a century and is one of America’s most loved and popular BBQ brands. Before you get started, assembly is a trifle awkward. Don’t get us wrong, it’s not going to take an entire working day but you won’t be searing any burgers straight out the box. This may or may not be an issue for you. If putting things together is not your strong suit, consider calling in some help rather than struggling. Getting the grill started is as simple as pushing a button so you won’t be chasing down a lighter or trying to light matches in the wind. Once you’re up and away, there’s more than enough room on the grill to flop out 20 or more burgers in a single sitting. This should be ample for the average family. This is achieved with a primary cooking space measuring 475 square inches coupled with a secondary warming rack of 175 square inches so you can keep the food coming without making your guests gnaw their fingers. The stainless steel burners and heat tents deliver 36,000 BTUs of heat so, even though you have spacious cooking surfaces, you won’t be sold short on power. The 10,000 BTU side burner is strong enough to do more than just pre-heat some sauce. The only snag is that you’ll need to remove this if you want to use a larger external propane tank. Although it weighs in at around 100 pounds, the wheeled cart design allows you to move the grill without straining yourself. The grease tray slides out for cleaning purposes and it’s a great way to minimize the mess that can otherwise clog up your grill in no time. Porcelain enamel coating, like you find on all the best gas grills, further lessens the way food debris can otherwise accumulate. Cleaning demands nothing more than a damp cloth. Wipe down your grill on a regular basis and that’s as far as clean-up and maintenance goes. There’s little worse than buying a BBQ which becomes an ongoing nightmare when it’s time to scrub down and pack away. Char-Broil offers a class-leading warranty. If you zoom in on the minuscule print of the guarantee, you’ll see that the burners, firebox and lid are backed for 5 years from the date of purchase. All other parts are covered by a 1-year limited warranty so you can eliminate thoughts of expensive repairs. While no grill is perfect, the very minor niggles with the Char-Broil are fairly insignificant and it really is a first-class grill at a very keen price. If you’re looking for one of the best gas grills without needing to take out a bank loan, the 475 merits a place on any shortlist. This cart-style grill works best when set up at home but, if you have a larger vehicle and fancy taking it with you on the road, it’s just about small enough for you to get away with it while large enough to make it worthwhile. Check out the Char-Broil Performance 475 for a no-nonsense, basic grill ideal for moderate barbecuing jobs. Now we’ve given you 5 of the top-rated grills to mull over, what should you look for when you’re buying one of these super-convenient BBQ solutions? Barbecue grills have become something of a fixture in American backyards while gatherings centered on the food cooked there are a large part of summertime tradition. Almost everyone loves a good steak, burger or hot dog blazed up on the grill but there is continued debate over what type of grilling is best. Are you a charcoal friend or do you prefer the convenience of a gas grill? Charcoal versus gas has been a heated backyard debate for as long as both grills have been around and it’s not likely to be resolved any time soon. Gas is incredibly easy to use and it has many benefits. Some diehard charcoal grill enthusiasts claim there are many drawbacks to gas grills but we would argue that there are just as many cons to using a charcoal grill. Cost: Cost is where a charcoal grill is the clear-cut winner. A basic charcoal grill is extremely inexpensive and will give you deliciously cooked foods while also lasting the distance. Gas grills cost substantially more because of their complexity. You can get cheap gas grills but you generally get what you pay for. Depending on what you expect from your gas grill, you can spend anywhere from a few hundred dollars to a few thousand dollars. 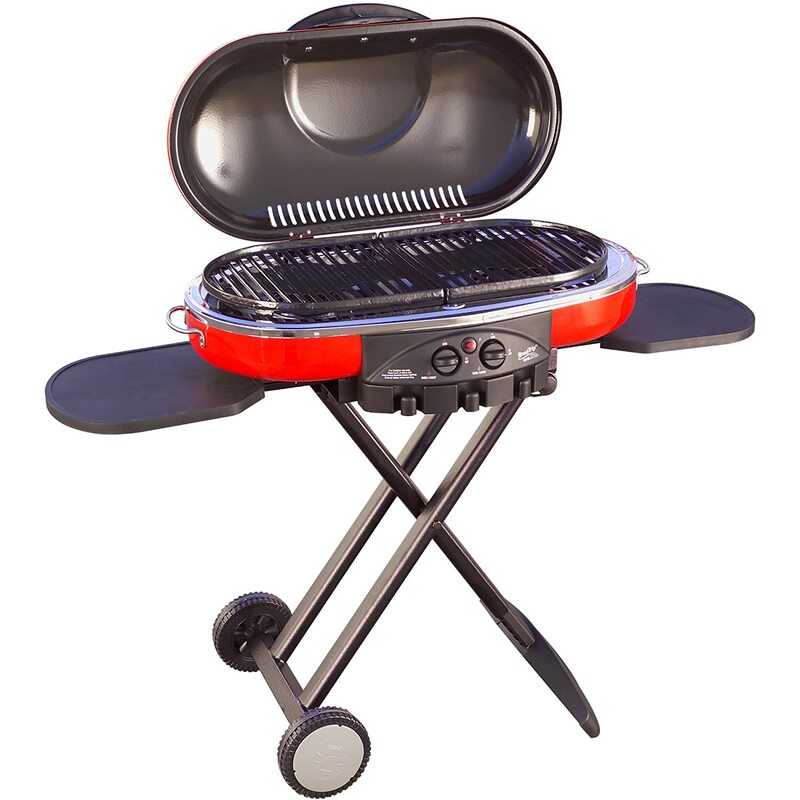 In return, you’ll get a dependable grill that will bring you many seasons of enjoyment. Wait Time: With preheating times, gas grills come out on top. All you have to do is ignite the grill with the turn of a knob, close the lid to allow the interior to heat and you’ll be good to get grilling in 10 minutes or so. The grill will stay hot and ready to cook for as long as you need it. On the charcoal side, you have to build the stack, light the fuel and wait. And then wait some more. And some more. Charcoal grills won’t be ready to cook on for at least 30 minutes after you light them and, once the fuel is lighted, you are on a timer. Once the coals begin to burn out, you are done cooking. On this point there’s simply no contest. Temperature Range: Another category in which charcoal grills come up trumps concerns the breadth of temperature at your disposal. With a charcoal grill, the temperatures can range from as low as you want them to as high as 1200 degrees Fahrenheit. This extreme heat output allows for incredible searing power. Gas grills, on the other hand, have a temperature range of 225 degrees to 600 degrees Fahrenheit depending on the model. Gas may not be the champion at searing, but there aren’t many things that call for searing. Controlling the Temperature: This is one area in which gas absolutely outshines charcoal and this is a crucial element of barbecuing. When using a gas grill, you can exercise complete control over the temperature your grill remains at and you can adjust it as needed. Get your burners to the temperature you need to cook your food and then relax with your guests. The temperature will hold steady until you turn it off or the gas runs out. Charcoal is a different beast altogether when it comes to maintaining the temperature. When using a charcoal grill, you need to make sure your charcoal bricks are relatively even in size to prevent some from burning up faster than others leaving you with an uneven heat. You must arrange the charcoal precisely to ensure the heat remains consistent and then you have to adjust the flow of oxygen through the grill to make sure the fire is also even. You have to stay near the grill the entire time and you need to work quickly… Once the fire goes out, you have to start all over. Flavor and Smoking: When cooking something for a long period of time, like when smoking meat, charcoal grills work best. Not only is it relatively simple to smoke foods on a charcoal grill but, because of the way charcoal burns, your food will be brimming with flavor. This isn’t to say it’s impossible to smoke foods on a gas grill, it’s just a little more complicated and you will undeniably get less flavor. Most people can’t tell if a burger or hot dog was cooked on gas or charcoal, but for other foods like brisket or ribs, the flavor from charcoal is distinct. Think about your intended usage and buy accordingly. Cleaning Up: Gas grills are a cinch to maintain. Cleanup is straightforward. All you have to do is turn the knob off and the flame goes out. Occasionally empty the grease from the collection tray and make sure you scrub down the cooking grates every now and then and you’re all set. When you are through using a charcoal grill, you have to let the charcoal burn out or you will need to suffocate the flame and wait for the grill to cool down. Once cooled, you have to find a way to dispose of all the ash from the burned charcoal. You will need to scrub the built-up grease from the cooking grates each time you use the grill. As you can see, there are many benefits and drawbacks to both types of grills so it’s a simple question of deciding which works best for you rather than seeking a right or wrong answer. Depending on what you are cooking and what your end goal is, there are pros and cons to both charcoal and gas grills. Gas is the standout winner when it comes to convenience, though. Even among the gas grill category, there’s a vast array of choice and quality should always be uppermost. It doesn’t matter if you are purchasing your first grill for your debut backyard BBQ or you are known through the subdivision as the king of the grill, there truly is something for everyone. There are a variety of features that grill manufacturers put into their products but which are worth paying for? What do all the numbers and specifications mean? How can you possibly know which grill is the best option for you? As we stated earlier, gas grills can cost a pretty penny but, as with most things in life, you get what you pay for. If you opt for a cheaper gas grill from your local big box retailer, you are likely to get a machine that will manage the basics but probably won’t last for more than a season or two. This doesn’t mean it’s necessary to drop $5000 for a high-end grill unless you really want to but make sure you take quality into account before making your purchase. Are you planning to cook a few hot dogs for your small family or will you be using the grill to cook dozens of burgers for large get-togethers? Make sure you have enough space in your yard for the grill of your choosing as well. You want it to be able to be set up a safe distance from your house or fencing while being used. Pay attention to what the grill is made out of. The last thing you need is a cheaply made grill that is going to rust and fall apart before the summer ends. That’s money wasted rather than saved. Look for quality materials like cast aluminum and stainless steel, and check the frame of the grill not just the cooking area. The cooking grates need to be made of decent metal as well. Buying a grill made from good materials will help ensure the durability of the grill and so save you money over time. Many gas grills come with an impressive list of features but do you really need to pay for all of that? Well, it depends on what exactly you are doing with your grill. The typical backyard barbecue doesn’t need a lot of bells and whistles. You really shouldn’t pay more for features that you won’t use and remember that all these extras are just more things that can break down as well as bumping the price up. Honestly analyze your needs and buy with these firmly in mind rather than being enticed into unnecessary frippery. 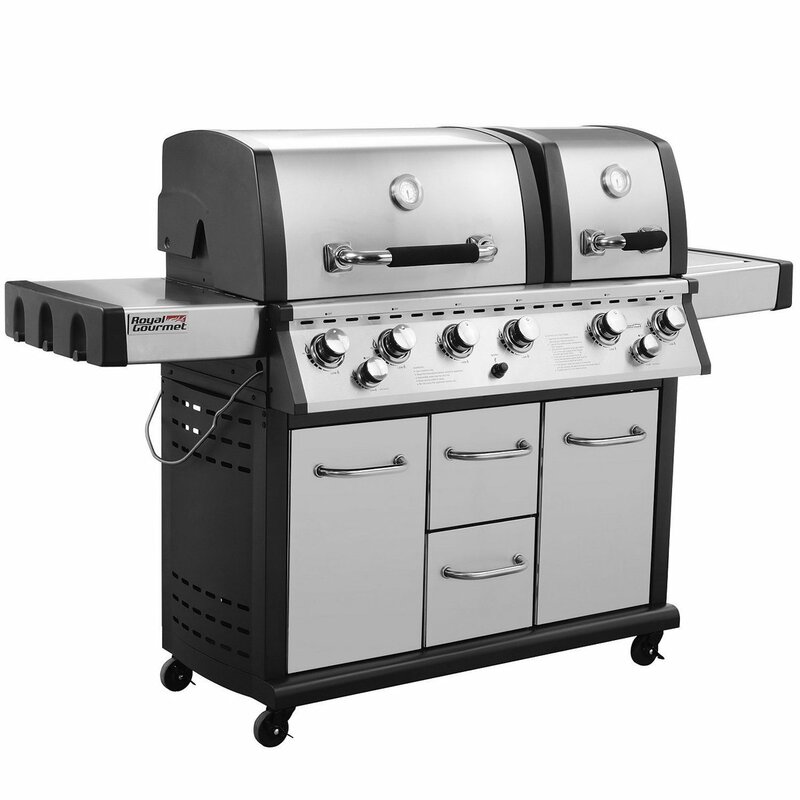 We’ve been talking about gas grills and you have 2 main choices here, propane grills or natural gas grills. Some grills are sold as dual-fuel grills meaning you can use them with either propane or natural gas. To use natural gas, though, you need to purchase an adapter kit and have the grill connected to the natural gas line in your home. Once this is done and the grill is connected, it will no longer be portable but natural gas is more affordable than purchasing propane tanks several times a year. Think about whether you prize portability or economy and make the best choice in line with this. Some grills use a battery to ignite the fuel while others create a spark that ignites the gas. Neither option is more beneficial than the other here aside from the added cost of a battery. Just choose whichever you prefer. What Else Do You Need To Think About When Buying a Gas Grill? You should always buy the grill from a reputable seller. Don’t opt for a cheaper store brand in the hope of shaving off a few dollars as they are less likely to have warranties and aftercare available should something happen to the grill. You can certainly get hold of inexpensive gas grills which is precisely why we have reviewed some solid budget options that won’t let you down. Make sure you leave room in the budget for other grilling essentials like propane tanks, grilling tools and a grill cover. You should always keep an extra propane tank on hand as having to go on a fuel run in the middle of cooking is the height of tedium. A good grill cover will help protect your grill from the elements and ensure it lasts for many happy years. 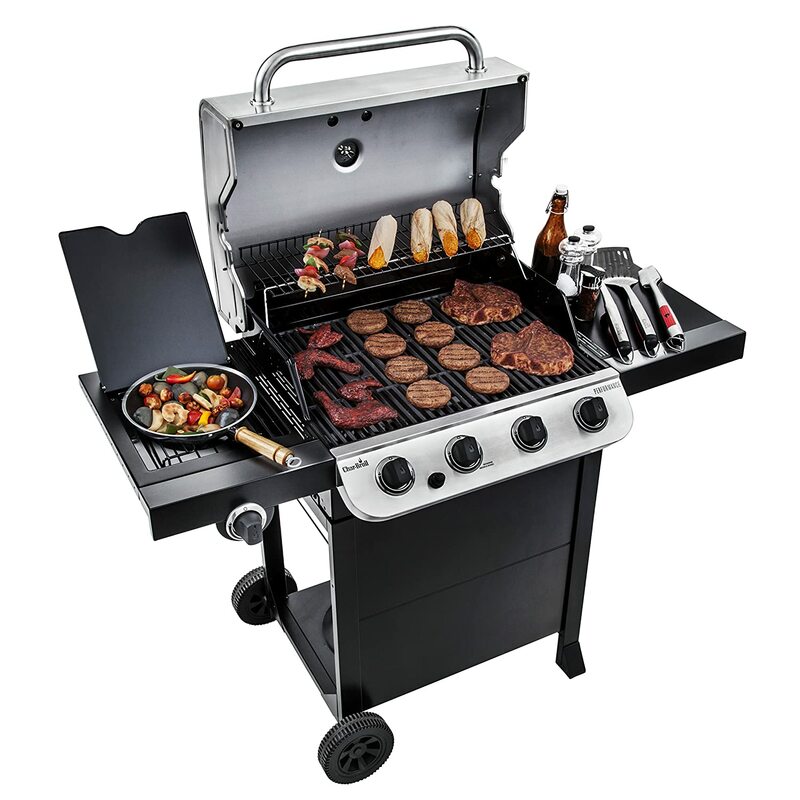 Gas grills are increasingly popular despite the cost. The main reason for this is that they are so much easier to use than their charcoal cousins. Gas grills operate a little differently, though, and it’s all too easy to make some schoolboy errors when using them. Use your grill correctly and you’ll get perfect barbecued food every time. Your equipment will last longer into the bargain. Keep The Lid Shut When Cooking: Yes, you need to occasionally check on the food to make sure it isn’t burning and you also need to turn it promote even cooking. However, every time you open the lid, you are letting heat escape and your food will take that much longer to cook. We trust you’ve found this exploration of the best gas grills along with the grill reviews has given you all the ammunition you need to get the cooking solution ideal for you and your family. Don’t hesitate to reach out if you have any feedback or queries. We love to hear from our readers and we’re always delighted to help in any way we can. Come back soon for more home and garden-related gems. Now go and fire up the barbie! Best Microwave Oven 2018: What Are The Top Microwaves On The Market?